Learn three basic exercises that you can do to increase your vertical jump and jump higher than you have ever before. Most fitness goals that people have are goals like lose fat, build muscle, increase strength, run longer, etc. But one goal that not a lot of people understand why someone would want accomplish is how to jump higher. The most common reason why someone would want to learn this is because for sport, the most obvious sport is basketball. Everyone one who watches basketball probably wishes that they could jump up and dunk a basketball, just like the professionals they see on TV. Even if it’s not for sport, I think a lot of people would like to jump high, just for fun. But for whatever reason you would like to jump higher, you should know that you can if you want. With practice and a regular exercise schedule you can higher. A lot of people think that in order for them to jump high they need to be tall. This is not the case. Yes, being tall is an advantage if you want to jump high, but you don’t need height. 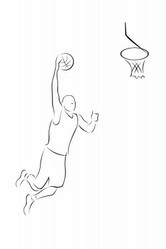 There are several NBA basketball players that are smaller than a lot of people, but they are still able to dunk. The main thing that you must do in order to increase your vertical jump is to increase the strength of your leg muscles. So that’s why I made of the list of the best exercises that do this. Most of these exercises are common exercises that you would perform in a regular training routine. But once you combine just these three exercises you can increase your jumping height. But if you want a more detailed training program I suggest you check out the program The Jump Manual. This program isn’t free, but it is by far the best training program to help you achieve at least 10 inches to your vertical jump. Squats are very common in most of weight lifting routines and there are a couple of variations of this exercise that I’d like to mention. The first variation is where you don’t use any weight. All you do is bend your knees, while keeping your back straight, until your thighs are perpendicular to the floor. Then bring yourself up again, repeating the exercise until you can’t perform another one. Another variation is similar to the first one expect that when you are bringing yourself back up, you do to in a bursting motion and at the same time you jump in the air as high as you can. These two are both great, but I suggest you start out with the first exercise if you aren’t used to doing these types of exercises. Once you feel that you can handle more, then try out the second exercise. They both work your legs, giving them strength, so over time you can increase your jump. The stronger your legs are the higher you can jump. The third variation is the most common one and that is a squat with a barbell. These will give you the biggest strength gains in your legs the fastest. You can either perform barbell squats with the barbell resting on your shoulder or you can perform the front squat so that the barbell is in front of you. Both involve you to increase your strength in almost all of your leg muscles. This is also a great exercise to increase testosterone in your body, which is important if you want to jump higher. You should use the perfect form when doing squats with any weight because it could lead to some serious injuries if you don’t That’s why I included some videos to help you out. These are also pretty common in gyms. Deadlifts are the best to strengthen your hamstrings, which is the muscle on the backside of your leg, above your calves. Deadlifts are also great at strengthening your calves, glutes, and lower back, which all of these are crucial to jumping higher. This is also another exercise that you must perform correctly to avoid injury. The third exercise is the most effective exercise of all. This is because it involves the same motion of jumping. It’s simple to perform and will also give you a cardio workout in the process. So, you see it really is possible to increase your jumping, despite your genetics or your height. All you need to do is some consistent workouts, proper nutrition, and willpower to keep going until you succeed. But if you want a step-by-step guide to show you everything to help you do this, you should definitely invest in The Jump Manual. It gives you a training program, diet guide, and if you have any questions about it there is 24/7 live support! If you want to learn how to jump higher, either for fun or for sport, just know that anything is possible!